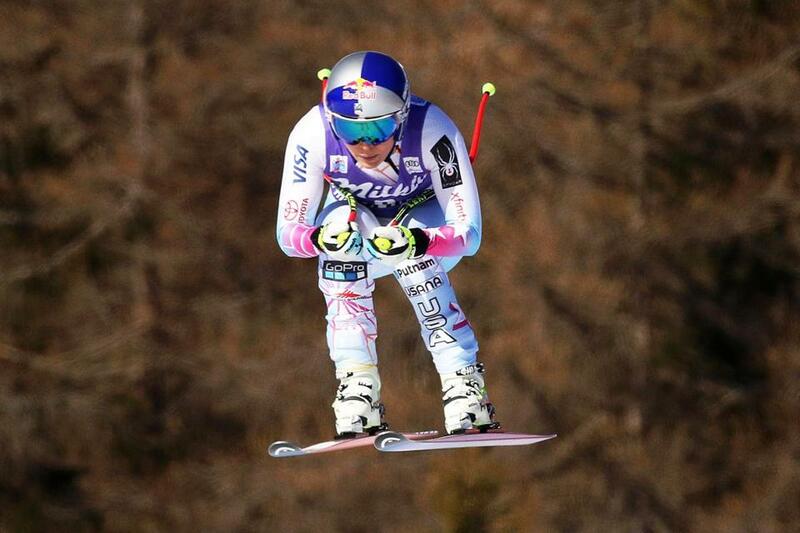 Lindsey Vonn soars through the air on her way to a World Cup downhill victory in Cortina d&apos;Ampezzo, Italy. Lindsey Vonn continued her Olympic preparations by easily winning a World Cup downhill race at Cortina d'Ampezzo, Italy. The American skier clocked in at 1 minute, 36.48 seconds on the sun-drenched Olympia delle Tofane course for a 0.92-second victory over Tina Weirather of Liechtenstein. It was Vonn’s second win this season, a record 12th in Cortina, and 79th of her career — moving her within seven of Ingemar Stenmark’s record 86 World Cup victories. American Jacqueline Wiles finished third, 0.98 behind, for her second career podium result. Vonn’s Italian rival, Sofia Goggia, the winner of the past two downhills, avoided a major crash after losing control while landing a jump. She made a quick recovery but could not continue . . . Thomas Dressen ended Germany’s 13-year wait for a men’s World Cup downhill victory, finishing in 1:56.15 at Kitzbuehel, Austria, to beat Beat Feuz of Switzerland by 0.20 seconds. Hannes Reichelt of Austria was 0.41 behind in third. Alina Zagitova put forth a nearly flawless free skate to win gold on home ice at Moscow in her debut at the European Championships and snap the two-year winning streak of training partner Evgenia Medvedeva. The 15-year-old Russian landed seven clear triples as well as two double axels, one of them dramatically late in the program. She scored 157.97 points, more than 3 points ahead of Medvedeva, who missed the Grand Prix Final and the Russian nationals this season to recover from a foot stress fracture. Italy’s Carolina Kostner, the 30-year-old Sochi Olympics bronze medalist, struggled through an error-filled free skate that included falling on her opening triple lutz, but took bronze on the back of her strong short program. French ice dancers Gabriella Papadakis and Guillaume Cizeron won their fourth consecutive European title, extending two world records they already held. The pair scored a record 121.817 points for their free dance and 203.16 total. 15-year-old Alina Zagitova of Russia shows off her gold medal after winning the ladies’ title at the European figure skating championships in Moscow. 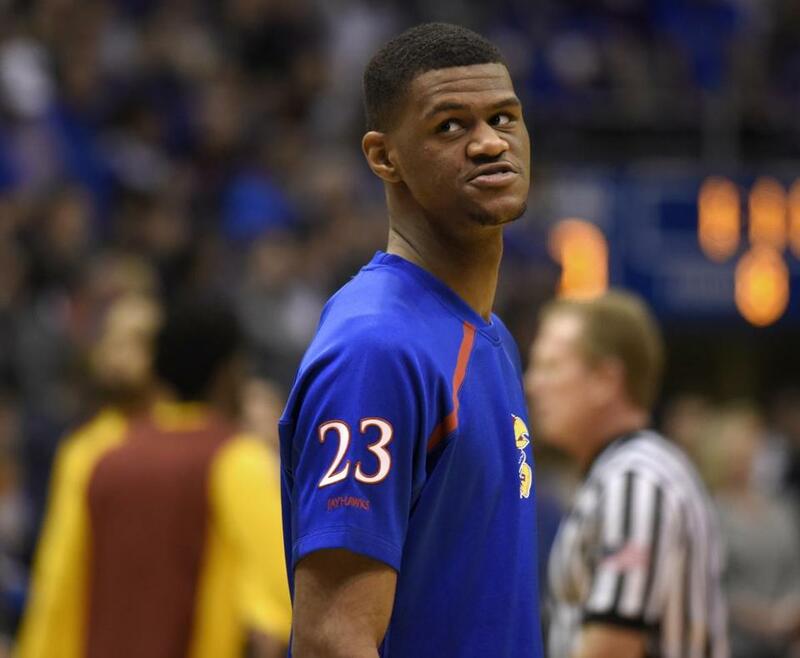 Kansas freshman Billy Preston signed with BC Igokea, a Bosnia and Herzegovina-based pro basketball team in the Adriatic Basketball Association, ending any chance the five-star forward prospect will play for the Jayhawks. Preston was suspended for the season opener after a car accident on campus in early November. The crash raised red flags about the ownership of the vehicle he was driving . . . Zion Williamson, widely regarded as one of the top three men’s basketball prospects in the country, announced that he is going to Duke. The 6-foot-5-inch, 275-pound forward from Spartanburg, S.C., chose the Blue Devils over Clemson, Kansas, Kentucky, North Carolina, and South Carolina . . . Hockey East suspended Northeastern men’s sophomore defenseman Jeremy Davies for Saturday’s game with UMass stemming from an incident Friday against the Minutemen . . . The Air Force Academy canceled all athletic events, including men’s and women’s basketball games against Fresno State, due to the federal government shutdown. The Falcons were also scheduled for men’s and women’s swimming, men’s ice hockey, gymnastics, and rifle competitions. Billy Preston’s Kansas career ended before it began after the suspended freshman signed to play in Europe. Summer Britcher claimed her fourth luge World Cup victory to add her name to the list of potential Olympic medal winners. The American trailed Natalie Geisenberger after the first run in Lillehammer, Norway, but Britcher was quickest in the second, beating the German by 0.033 seconds for a combined time of 1:35.266. Germany’s Julia Taubitz was 0.263 behind in third, while American Erin Hamlin, who is headed to her fourth Olympics, finished 0.490 seconds off the pace in ninth place. In the doubles race, world champions Toni Eggert and Sascha Benecken of Germany were quickest in both runs to win in a combined time of 1:34.586 . . . Canada's Justin Kripps won his first overall World Cup bobsled title after placing third at Koenigssee, Germany, in the last 2-man bobsled race of the season, while compatriot Kaillie Humphries claimed her fourth women's title. After eight races, Kripps finished with 1,631 points to beat defending champ Francesco Friedrich. Humphries finished with 1,631 points, 40 ahead of American Elana Meyers Taylor, who was third in Koenigssee with Lauren Gibbs. Friedrich was fastest in both runs of the men’s race for a combined time of 1:38.97. Germany’s Stephanie Schneider won the women’s race, clocking a combined time of 1:41.35 to beat two-time Olympic champion Humphries by 0.29 . . . Milwaukee Bucks forward Giannis Antetokounmpo, the NBA’s second-leading scorer, missed Saturday's game at Philadelphia and will sit out Monday's home tilt with Phoenix with a sore right knee.